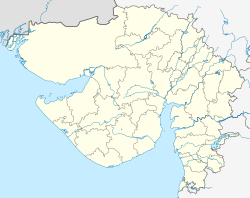 Vadodara (IPA: /ʋə'ɽod̪əɾa/), which uised tae be kent as Baroda, is the third lairgest ceety in the Wastren Indie State o Gujarat, efter Ahmedabad an Surat. ↑ 2.0 2.1 2.2 2.3 "Institutional Setup in Vadodara" (PDF). Vadodara Municipal Corporation. Archived frae the oreeginal (PDF) on 29 September 2007. Retrieved 29 July 2007. ↑ "Ward Office Conatact Numbers". Vadodara Municipal Corporation. Archived frae the oreeginal on 29 September 2007. Retrieved 22 June 2007. ↑ "List of Lok Sabha Members from Gujarat". Lok Sabha. Archived frae the oreeginal on 14 October 2007. Retrieved 30 June 2007. ↑ "List of MLAs from Vadodara District". Gujarat Vidhan Sabha. Retrieved 30 June 2007.